Spicy Chicken and Cabbage Stir Fry | Don the Apron! Sometimes you come in the front door exhausted from a long day and all you want is a super fast meal that reminds you of home. Here is one of mine. I am personally a big lover of cabbage — not just in raw cabbage salads (seriously could eat those forever), but as a great stir fry ingredient. Cabbage is nutritious, cheap, and filling. It lasts forever in the crisper, emerging like some kind of awesome mummy – just peel away a layer or two and we’re good as gold. Slice head in half, cutting the stalk in two. On the half you’re going to use, remove a layer or two of the outer leaves, until the head is unblemished and fresh-looking. Rinse. Flip the cabbage on the cutting board, with the cut (flat) side down. Holding the knife perpendicular to where the heart of the cabbage used to be, begin thinly slicing the cabbage. You will cut through multiple layers and end up with “ribbons” of cabbage. I usually stop here, but if you prefer your cabbage smaller, rotate the cutting board 90 degrees and cut shredded cabbage down to desired size. This dish is super homey, and made with typical Chinese pantry ingredients. If you don’t have five spice powder, try using any combination of the individual spices in five spice: star anise, clove, cinnamon, Sichuan peppercorn, and ground fennel. The cabbage adds bulk and crunch, while the chicken is simple and adds a little protein, making a very budget-friendly meal. I’d recommend adding julienned carrot to improve the presentation of the dish. The flavorings (soy sauce, cooking wine) as well as the liquid from the wilting cabbage create a nice little brothy sauce (what we call “chap” in my family) that melds the flavors nicely. When serving, make sure everyone gets cabbage, chicken, and a few spoonfuls of the broth on top. Finally, like most wok/stir fry dishes, it is imperative to keep the heat in the pan high. I’ve included tips for this in the directions. Serve this with some rice and you have a very simple, quick, filling, one-dish meal. The cabbage stays relatively crisp when refrigerated, so the dish works well as leftovers. Preparation: Have all ingredients ready to go (e.g. chopped, etc. ), because once you get started, there’s no stopping this train! Add 1/2 teaspoon soy sauce, white pepper, and five spice powder to chicken pieces, and mix. Set aside. Flavor the oil: Heat oil at a medium-high to high temperature in a large skillet or wok. When oil is shimmering hot, Add minced garlic and ginger, and stir fry until slightly brown and fragrant. This flavors the oil, and therefore the entire dish. Don’t let the garlic/ginger burn, it will taste terrible and you should just restart the dish! Cook the meat: Immediately add chopped chicken — sliced against the grain for the tenderest bites — and cook through. Depending on the heat of your pan, you might be able to get a little sear on the meat (although not traditional for Chinese stir fries, it can be a nice addition to the color/texture): lay the chicken pieces in the very hot garlic/ginger oil, and let them sit until they are slightly brown on one side. Flip, and allow the other side to brown. This only works if your pan is very hot, because the small pieces cook quickly. We want the chicken to be just cooked and tender. Overcooking the chicken is no bueno! If you don’t have space for all the chicken to cook at once, work in batches. Add in the cabbage: Moving the chicken to the perimeter of the pan, add half the shredded cabbage into the pan, and allow to heat through, taking the cooked cabbage from the bottom of the pile and moving it to the top. Once the majority of the cabbage is wilted and the temperature of the pan rises back to high, make a well in the center of the pan and add remaining raw cabbage, covering with already cooked cabbage and repeating the process. This allows us to keep the temperature in the pan high and most efficiently cook the cabbage. Season: Once all cabbage begins to wilt, add soy sauce, wine, and sesame oil. 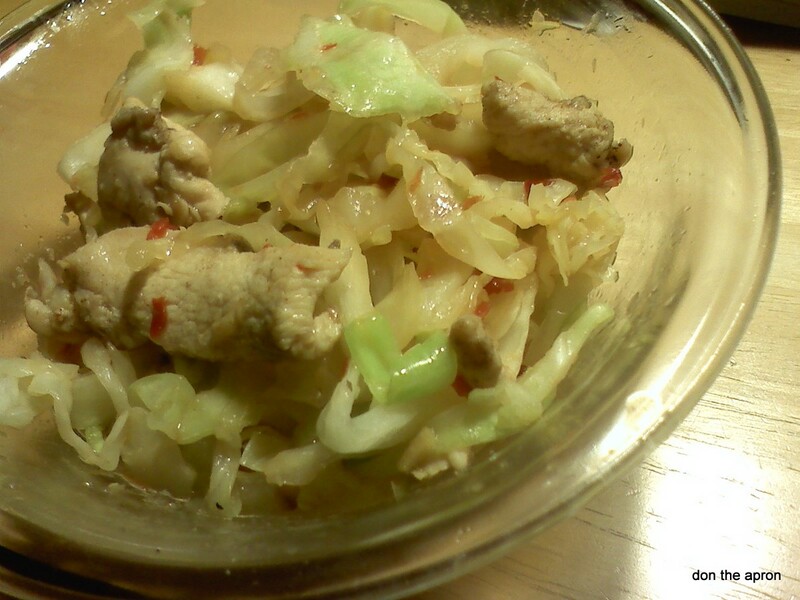 Keep stir frying the cabbage and chicken together, mixing the seasonings. Cook until cabbage is evenly tender-crisp, add chili sauce to desired heat (I used ~3 tablespoons, but I love things with a kick). Serve. I tried the stir fry tonight. It was great! Thank you so much. I like stir fry but no good at it. This was so good that I joined the blogg—–my first! I just made this.. Its yummy! I added a green chilli instead of the chilly sauce! Super!